Waffenrock also known as Waffenkleid, Wappenkleid or Wappenrock. Warrior's dress from end of 14th century, based on Viollet le Duc illustration. Base price includes linen fabric without lining. Please choose the wished fabric in options. Lining fabric is also available for choosing. Corset is made of black atlas with minimum decoration. There are functional fastening busk from the front and lacing from the backside. Descriptions: it is glued with thick cotton sheeting lining is made of natural linen all seams are reinforced with metal bones Wissner waistline is hardened with braid Corset is decorated with delicate red lace. ..
Corset is made of artificial suede of German production. Upper line of corset underlines breast shape. Corset is suitable for women with big or small breasts. There are functional lacing from the backside and corded silk ribbon for lacing from the front. Front edge is decorated with pointed applied ornaments and bronze elements. 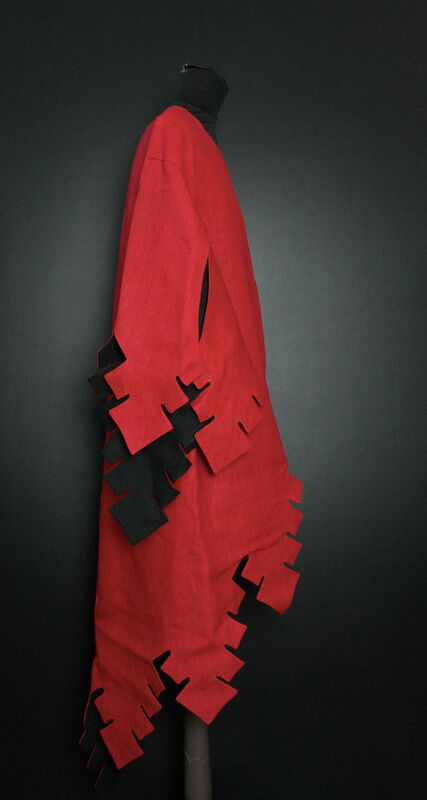 Descriptions: It is glued with thick cotton sheeting; lining is made of natural linen. All seams are reinforced with metal bones Wissner. Waistline is hardened with braid. .. Going to medieval festival, don’t forget to order splendid custom tabard at Steel Mastery’s handywomen, in which you will be recognizable among all the knights. For aficionados of high-quality goods our tailors are ready to sew not just a tabard, but almost complete costume. 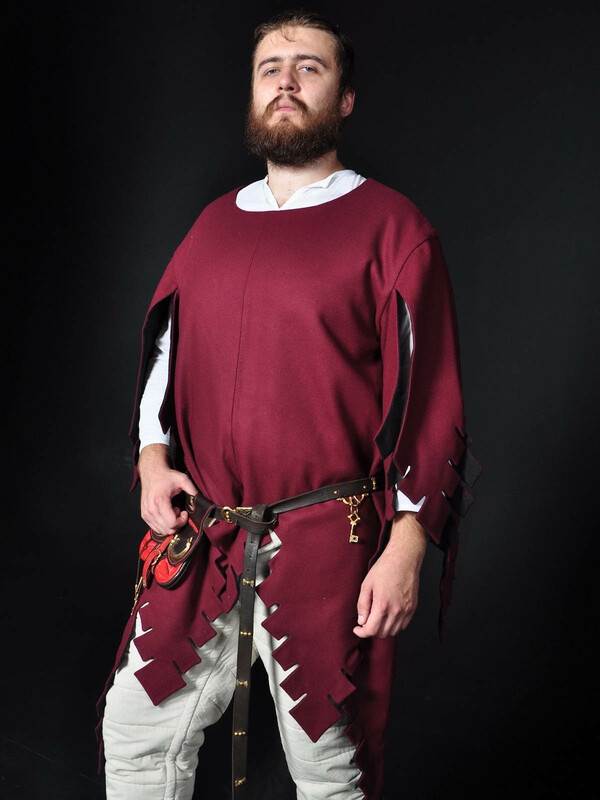 Like this respectable and chaste tabard costume with straight bottom edge and long sleeves. However, choice of colors and personal emblem is up to you. 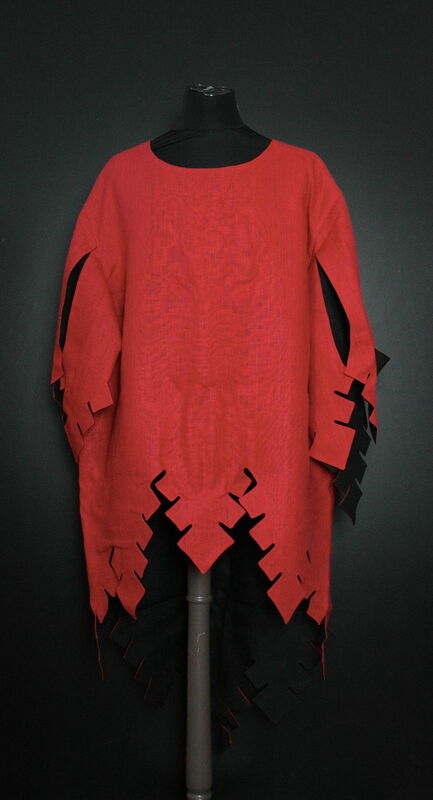 For example, here is black and red medieval tabards for sale, colors of which tell us about bravery and wisdom. On the coat of arms, which is divided with overturned forked cross, there is a caduceus at the bottom and crossed axes on the top. Such a coat of arms on the knight tabard means that knight is owner of virile mind and martial prowess. What emblem will you choose? Tabard on photos is a sample of tabard, which we can produce. You can modify it, as you wish. For example, you can choose: main fabric – cotton, linen, wool; lining fabric – cotton, linen; decoration –&nb..
Fantasy costume "Sapphire" Double, double, toil and trouble. Fire burn and cauldron bubble. Very few mortals are allowed to step in the recess of the sacred oak-wood. Actually, they have no business being in place, where witch cauldrons boil and wicked wind blows. But, very few initiated women are allowed to come into forest and they have to wear such fantasy costume for female, as it will not anger spirits. Long wide shirt down to the ankles. Black as a night, soft as clouds, flying as a wind. There is no sacred dance, which could not but danced in it; there is no poison, which could not but cooked; there is no a ritual, which could not but performed. Every witch (as actually, any woman is a witch a little bit) has such shirt or even few in her wardrobe. Over this airy cloud of gloom, she wears peplos of deep blue color – plain and straight as high waterfall, which hadn’t been changed for thousand years. It still makes any figure thinner and emphasizes image and dignity of true woman. Thin, almost i..
Fantasy dress "Amethyst" Spear of fire, burn so brightly As the sunwheel in the sky Spear of fire, burn within me O híu Noshàh, o Lughnasadh When summer comes to the end and days become shorter. When harvest is cropped and hidden to the barns. When sun warms less and evenings and nights are touched by coolness. When it is time to get in blueberry and bake the pies of grains from new crops. When autumn came… When it is time to feast Lughnasadh and god Lugh tops on the hill to take a participation in festival and takes the sacrifices… Then a maid gathers hairs and wears her the best fantasy dress “Amethyst”. What a dress! Oh, Gods, what a dress! Even Lugh is glad to see it. Light, wide and thin undershirt is made of smooth cotton of azure color. Cuffs and neckline have so small pleats that they seem a lacework, which flow over body, intriguing and tempting. It is like a piece of summer sky; it is bright and clear, reminds of the past summer, and delights an eye of God with this deep color. Cotton upper tu.. When you choose a coat of arms, the only one, which will adorn your standard and you knight tabard, it is very important not to make a mistake with symbols and put that sense into it, which you have in mind. And, Steel Mastery will gladly share with you examples of works, in which we have turned ideas of other dignified knights into life. There is quite unusual medieval tabard, separated on three parts with incurved peak, with elongated with shoulder pieces and black festoons on the bottom edge. On the right upper part, there is a black rising lion on the yellow field – symbol of power, braveness and generousness. On the left upper part, there is a truncated black eagle on the white field – symbol of immortality, braveness, insightfulness and power. Bottom part with scarlet field shows us white crossbow as one more confirmation of might and courage of owner. 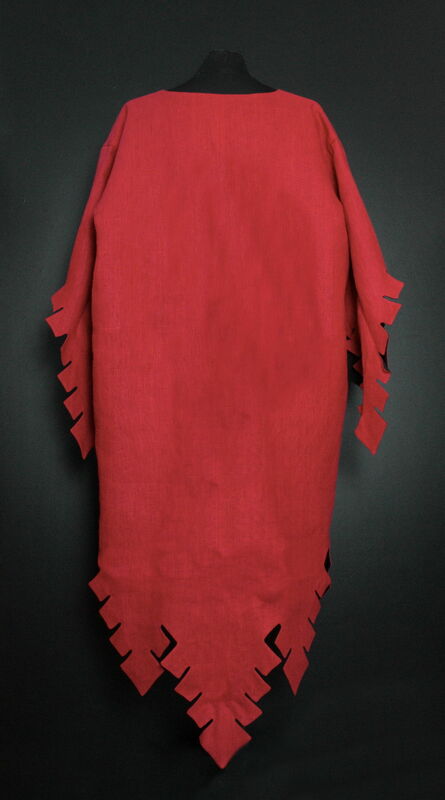 On the shoulders and back part of this tabard tunic, we can see a black eagle again. However, not a truncated, but whole one. This medieval knig..
Let’s play a game – “Guess a knight by his tabard”. Here is white crusader tabard with four-parted coat of arms. So, let’s have a look at it and will try to guess what we should expect from its owner. Upper left quarter has quite unusual combination of figures. There is the blue Jerusalem cross on the white field. Besides, four small and one Grand Cross are Greek crosses, which represent drops of Divine blood. The Jerusalem cross is a combination of symbols of Christ and four Apostles, who disseminate for four corners of the earth, by being authors of four Gospels. According to another rendering, there is Cross of Crucifixion and four nails, which spiked Body of Christ. So, judging by the right upper part, we see true warrior of Christ. On the right bottom quarter, the white field is slashed with blue strips. Coinciding with each other, colors of these quarters tell us that knight strives for victory, combining purity, honour, mercy, fairness, faith and religious devoutness. On the right upper quarter of our medieva.. Medieval peasant dress "Sun" Brocade is queenly; velvet is luxurious; silk is delicate; wool is comfortable and linen is soft… So, when choosing a dress for one more reenactment event, beautiful ladies hurry to order it made of these fabrics. They forget about simple, but amazing fabric. A foreigner, whose way runs from the deep of ground to the sun. Today, we will tell you a fairytale about cotton that was used for making of this plain, but feminine medieval times dress. As born of this dress begins from the same moment, when cotton crops up the ground, lofts and blossoms with snow-white flowers. From the same moment, when cotton flowers, being warmed with sun rays, are changing to hard cotton balls, full of airy fibers, soft and tender as butterfly wings or even more tender. From the same moment, when fibers is being got out of cotton balls with care and is being teased, mixed, cleaned, stirred, pulled without remorse… From the same moment, when cotton fibers are spun, fabric is waved, and tailors cut this fabric and s..